Where is this location in the vehicle and how do I gain access to it?? Last edited by Kjelle69; 03-24-2019 at 11:23 AM. S208 was re-identified as J208 in 2008 and is either a splice or junction. 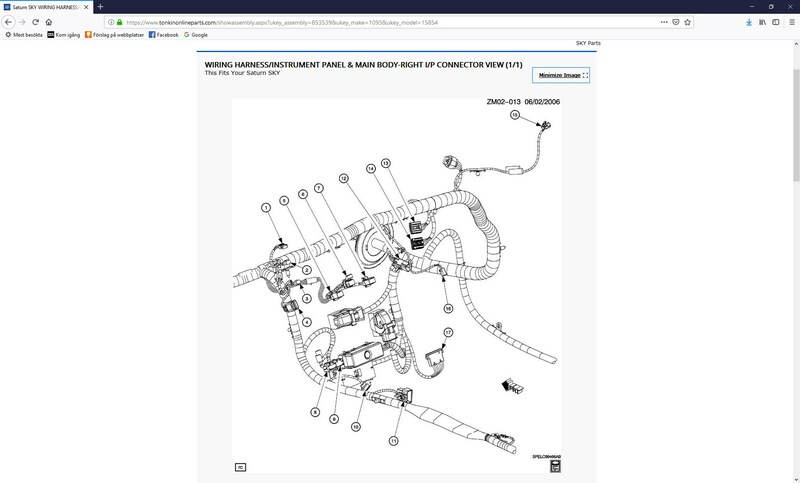 I cannot find it on any of the harness diagrams, but the component locator states that it is near the ambient light sensor, which would put it deep in the dashboard, and not very accessible. The actual ground point that it uses is G300 which is located on the tunnel near the hand brake lever, and accessible by removing the center armrest. I checked all ground points that I could get to. You are right @JohnWR about the fact that a broken ground should not blow fuses. Unlock Control). I tried to disconnect this external cable and that made the left door remote locking stop working. I disconnected the contacts and measured between the X600 (right door) and the X500 (left door) contact and could see that the Tan cable was grounded regardless from which way I measured. I also measured betweer each side and real ground (car frame) and the same result. Grounded from both ways. This must be the reason that the fuse blows right? 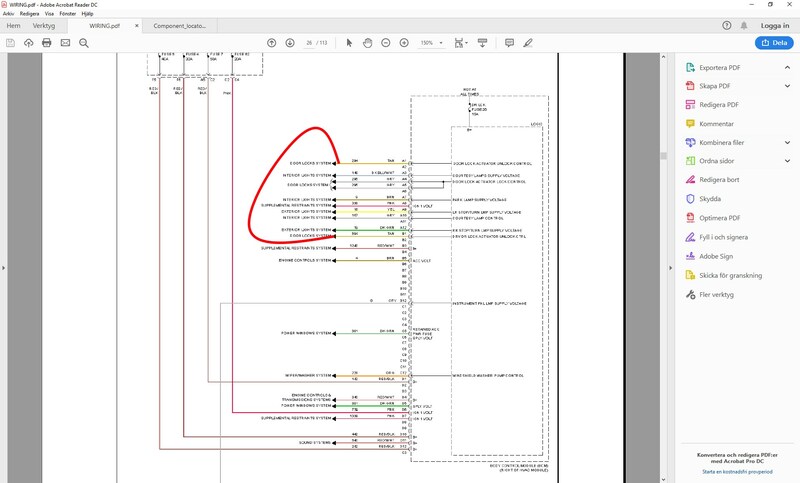 I will do some more research in the wiring diagrams but IF this fix is needed the Tan cable between the contacts should be cut and replaced by the externa cable between the doors not put in parallell. I wonder where the fault can be... ? I disconnected all cables that was not supposed to be there. Now the remaining faults is that the Driver side door does not UNlock with the remote. However If I unlock it manually it does lock with the remote. The attached image shows what they tried to do to "hotfix" the fault with the drivers side door. I also tried to lock and unlock the doors with the button on the doors. It works the same way as with the remote. Last edited by Kjelle69; 03-24-2019 at 03:32 PM. 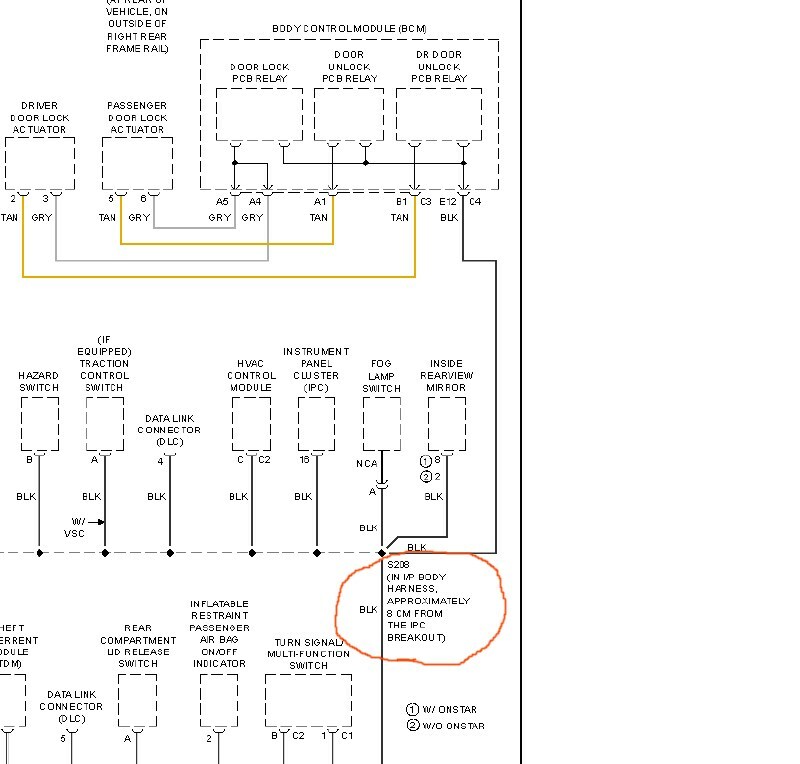 My best guess is that the driver door unlock relay (soldered to the PCBoard) is not cycling, and they tried to get around it by connecting the driver's door to the passenger door circuit. The courtesy light / door ajar signals are independent from each door. Does the courtesy light work with either door? Yes, I am thinking the same. I might have to change the BCM with all that comes with that, reprogramming etc.. The courtesy light does not work at all, not even with the manual push buttons in the mirror. The lights in the mirror have two different operating modes: manual on/off with the switch on the mirror, and automatic when the doors open. Do your mirror lights work either way? If they do not, it could be the Inadvertent Load Control relay that is soldered to the PCBoard, or of course the interior light fuse. In manual mode they are grounded as you mentioned, but in automatic the ground is through the BCM, Voltage supply is the same in both modes. The mirror lights are not working at all, regardless of how I try to activate them. All fuses are ok and I have 12V at the input to Fuse 26 and 27. When I am connecting the diagnose tool. (The same "Nano" as you have) and look at the Inadvertent load control, it "Flickers" in the Tech-2 sceen. (Goes on and off all the time).